ðŸ’— Hey Valentine... 5 Ways to Love your Body! These are the Lord's thoughts about you! He has created you exactly as you are for a purpose. You are so beautiful and perfectly made in His sight! Take a few minutes today to write down things you love about the way God made you. Now, go share this verse with a friend! Encourage your sweet friends today in their own beauty, inside and out. Valentines Day is the day of love! Let's be intentional about spreading love, encouragement and blessings as much as we can. Now we know many of you will be spending Valentine's Day with your families so we wanted to share a few of our favorite healthier Valentine's Day recipes with you all! We guarantee these will satisfy your sweet tooth just as well as that box of Russell Stover- but without compromising your nutrition goals! These are treats (in moderation) you can feel good about, because they will not only make your taste buds happy but make your body happy as well. First, here are our Top 5 Ways to Love the Body you have been gifted this Valentines Day! 1. Make a Valentine's celebration breakfast! 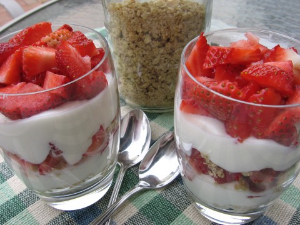 Make some fun Strawberry Love Parfaits to start your day with a sweet, healthy breakfast that tastes like a treat! Take some time to say 5 reasons why you love each other as you eat your breakfast. 2. Celebrate with non-food items! If you're sending your kids to school with Valentines, try sending cards along with temporary tattoos, stickers, pencils or other fun little toys instead of candy. Be sure to emphasize that these are things they can enjoy over and over and not just once! Get crafty and make fun, homemade cards with markers, watercolors, etc. 3. Spread out the sweets! Naturally, we're all going to eat some sweet treats on Valentine's Day. However, all of these treats don't have to be eaten on this one day! Pick 1-2 of your top choices for today, and then put the rest away to enjoy in moderation for days to come. The longer you spread it out, the more times you get to enjoy the treats! 4. Try a new, healthy recipe! Below you will find several of our most favorite healthy and easy sweet treats! Try making these for you and your family, friends or significant other! Line baking sheet with wax paper. Melt chocolate. Stir in granola, zest and cinnamon. Spread out onto baking sheet and top with cherries and salt. Chill for 30 mins or until firm. Enjoy! Take 1 cup of strawberries and blend in blender until smooth. Hullrest of the strawberries and cut them into slices. Mix the yogurt with the blended berries. Begin layering the Mini Trifles. Start with a layer of greek yogurt. Add a layer of strawberries. Next sprinkle granola on top of the strawberry layer. Repeat layers until the mini trifles are full. Garnish with strawberries and/or granola. In a large saucepan melt butter over low heat. Add in marshmallows and stir until completely melted. Remove from heat. Add Brown Rice Krispie Cereal and stir until fully coated. Flatten the mixture on wax paper and use a heart-shaped cookie cutter to cut out hearts or use your hands to shape the mixture into hearts. Top the hearts with fresh sliced strawberries and gently press down to seal them. (You could also mix the strawberries in with the marshmallows). Cool before serving. We hope you enjoy these recipes with your family and friends! Take a picture of your healthier Valentine's day! We would love to see what you and your family and friends did! We look forward to seeing you in the studio! Come join us this morning at 8:00 AM! â�¤ï¸� Love Your Body! New Runner's Home Workout!